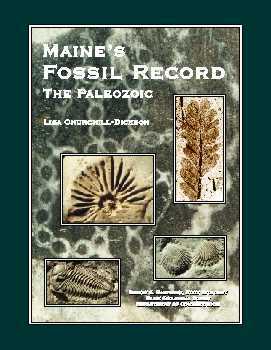 The Maine Geological Survey has published "Maine's Fossil Record: The Paleozoic." This 500-page book is the most comprehensive treatise on Maine's bedrock fossils ever published. The primary purpose of this book is to serve as a stand-alone reference for Maine's Paleozoic paleontology, whether it be for the interested layperson or professional geoscientist. For the general reader, Chapters 1 and 2 cover introductory material and acquaint the non-scientist with basic geological and paleontological concepts. A general overview of each of the taxonomic groups is given in Chapters 3 to 12, including stylized line drawings and photographs of typical Maine specimens. Life in Maine during the Cambrian through Devonian, and a summary of the major geological and biological events during that time are discussed in Chapters 13 to 16. Chapter 17 briefly discusses life in Maine following the Devonian. Information relating to fossil collection is discussed in Chapter 18. A glossary of technical terms can be found at the end of the book. For the professional, Chapter 1 provides a general overview of past paleontological work in Maine. Detailed listings of taxa, including basic systematic information and generalized ecological distributions, are provided in Chapters 3 to 12. Discussions of Maine's tectonic and environmental settings, including a listing and brief description of all fossiliferous formations, are contained within Chapters 13 to 16. Case studies providing additional detail for particular formations and ecomatrices, showing the distribution of organisms with respect to bathymetry and lithology/substrate, are provided in Chapters 14 to 16. Technical appendices include complete and fully referenced taxonomic listings arranged by formation/unit (Appendix A), criteria used to assign bathymetric ranges for each unit (Appendix B), and the data used to construct a standardized stratigraphy for Maine's fossiliferous units (Appendix C). Our main focus throughout the development of this work has been to make Maine paleontology more accessible to all groups. It is through this increase in accessibility that the history of life in Maine can be more fully utilized and appreciated by the professional, educator, and layperson alike.